These delectable little cookies are seasonal and wheat free. They also make a fantastic doggie gift. 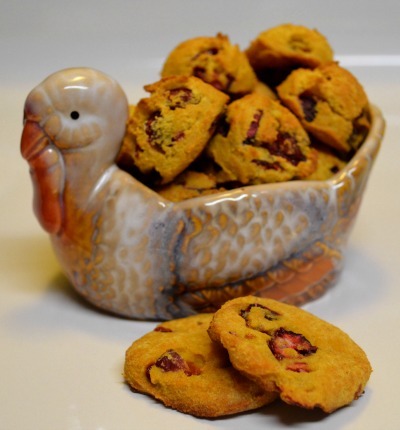 This cranberry and pumpkin recipe makes about 3 dozen cookies, so feel free to share with all of your dogs friends. Cranberries are loaded with antioxidants, fiber and Vitamin C. Add to the fact that these dog cookies have pumpkin and yogurt, you're dog is sure to devour these healthy treats. Don't get fresh cranberries mixed up with the Craisins you see in stores. The dried variety often has added sugars and your dog does not need that in her treats. You can however look for unsweetened dried cranberries. But, this time of year you should be able to find fresh cranberries in about every store. If you can't find the fresh variety, you can also use frozen cranberries. Thaw the cranberries, rinse them well, and dice them to a small size before adding to the batter. In a large bowl, whisk together the brown rice flour and the Garbanzo bean flour. Stir in the pumpkin and yogurt into the eggs. Make a well in the dry ingredients and pour in the pumpkin mixture. Scoop dough with a small cookie scooper. Flatten each dough ball and bake for 20 minutes. Turn off the oven, and let the treats cool in the oven to make them dry and chewy. 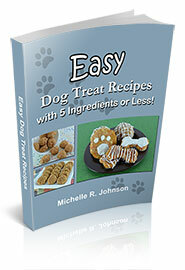 If you're ready to take your homemade dog treats to the next level, consider reading my review of the best eBook on How to Start Your Own Dog Bakery Business. The good news is that even if your dog has already been diagnosed with diabetes, you can learn to control it. Plus, your dogs life expectancy can be about the same if you learn to properly control your dogs diabetes. The second special event for November is Senior Pet Month. If you already share your home with a senior dog, you know the joys of these distinguished dogs. But, if you or someone you know is considering adopting a dog, please, consider a senior dog. There are many benefits of adopting a senior dog. They are full grown, so you know exactly how big they will get. Also, being adults, they have grown out of the "chew everything" puppy stage. Some seniors are already completely potty trained and know a few tricks. Learn more about adopting a Senior Dog at your local animal shelter. At the very least, you can find out from your shelter when you can volunteer to love and care for the senior dogs waiting for their forever home. 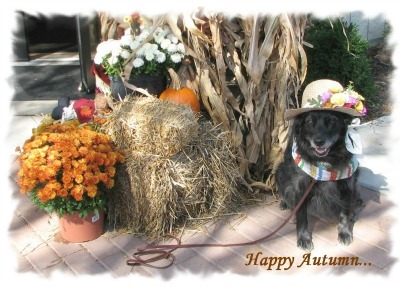 "Britney Ann is a Rescue Australian Shepherd-Black Labrador Retriever who turned 14 years old on May 1st, 2014. She is all decked out in her Fall Finery." "She asked me to share with you her favorite homemade treat which I make for her to support her liver function and keep her weight down." Cook the chicken livers until they are well done. Cut them up into very fine bits, almost like powder. Mix them in a bowl with the raw ground sirloin/beef. Roll the mixture into little balls about the size of a quarter. Place on a flat plate in the freezer until frozen. Put into a tightly sealed container and keep in the freezer again. Take one or two out and defrost each night/day for a yummy treat that has no grains, wheat, soy, or by products; and is not a processed food. Britney Ann tested and approved--WOOF! WOOF! And made with love by Mom or Dad :)"
"Thank you so much for the information you have offered through your website. I have some sick pooches and I have to learn to feed them differently. You have given me some insight to their healing through the recipes you have formulated for certain health problems. Thank you once again."